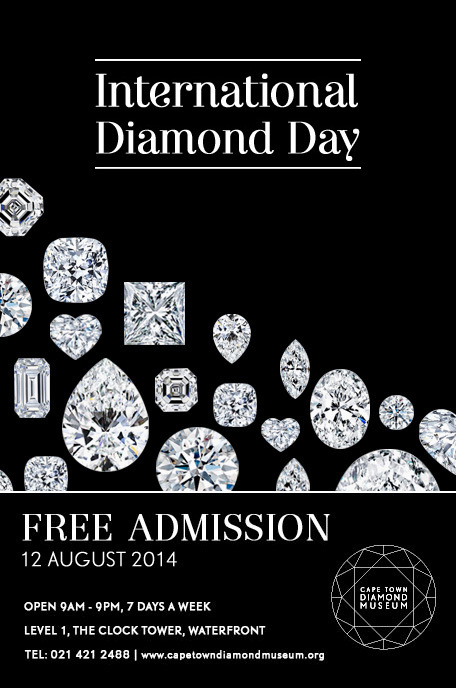 Discover more about the world’s most precious gem this Tuesday, 12 August 2014, as we celebrate International Diamond Day. Enjoy an unforgettable experience in the heart of the famous Clock Tower precinct at the Waterfront and receive a guided tour from a diamond professional through the museum. Experience, explore, discover and learn about the world’s most precious gem and come away with a new found knowledge about the wonderful world of diamonds. Diamonds are considered as one of the most valuable gems in history. International Diamond Day was invented to express your love towards the most precious people in your life. Located adjacent to the museum, The Shimansky Showroom hosts a wide range of exquisite and rare signature diamond jewellery, presenting the perfect opportunity to spoil that special someone (or yourself) with the most precious gem in the world – the diamond. The Cape Town Diamond Museum is offering complimentary admission on 12 August 2014, from 9am till 9pm – so invite your loved ones and learn all about these fascinating gems. Book your diamond tour here to avoid disappointment or call 021 421 2488.